Just in time for the upcoming Little Mo Southwest tournament at the Wigwam Resort in <?xml:namespace prefix = st1 ns = "urn:schemas-microsoft-com:office:smarttags" />Litchfield Park, USTA Central Arizona is pleased to announce the winner of this past year’s Little Mo Nationals Sportsmanship Award: Reagan Posorske of Cave Creek. 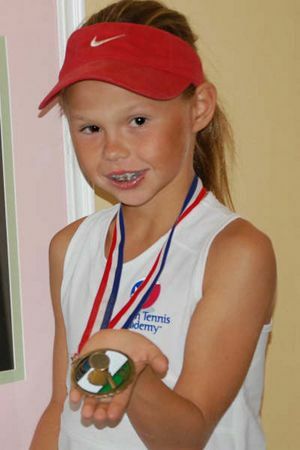 But it wasn’t the typical tennis victory for Posorske, a top local junior. After returning from the Little Mo Nationals last fall in Austin, Texas, she received a letter and medal in the mail for winning the tournament’s Sportsmanship Award! Posorske's love of the game and enthusiasm for competition was noted by the officials and members of the Maureen Connolly Brinker Foundation, who bestowed the honor. Reagan works hard to play fairly, win with humility, lose with dignity and to appreciate her opponents. The “Little Mo” tournaments are sponsored by the Maureen Connolly Brinker Tennis Foundation in memory of its tennis champion namesake, Maureen Connolly, who was known as “Little Mo.”	She was the first woman to win the Grand Slam in 1953 at 18 years of age. She is still the youngest Grand Slam champion and the only American woman. The Little Mo Southwest Tournament is scheduled for May 22-24 at the Wigwam Resort, which feeds into the Little Mo Regionals in San Diego this July. For more information, click here. For more information about the Maureen Connolly Brinker Tennis Foundation, click here.